What is an airfryer you might ask. This is a device designed by Philips which uses a continuous flow of heated air to cook food. Why did i choose an airfryer? I have seen these appliances around for a long time now. I was intrigued by the claim that you use only a tablespoon of oil for frying whereas pan frying or deep frying uses much more oil. The more research i did about these products, the more i knew that they could be used not only for frying, but you could also use it for baking and roasting. The slogan of ‘great tasting fries with up to 80% less fat’ caught my attention big time as i love to eat french fries but deep frying them in hot oil is not exactly healthy. 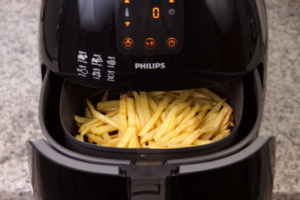 Below is my review of using the Philips Airfryer XL. The XL version of the airfryer is the largest capacity in the Philips range of airfryer’s. You have two color variants of this appliance – black and white. This appliance has a rated capacity of 1.2 kg or 2.65 pounds. Using this appliance you can cook a meal which can feed for up to five people. The package comes with a color recipe booklet. This booklet has a some recipes to get you started. Depending on which part of the world you bought this appliance, the recipe booklet will feature recipes that are common to that particular region. Even though there are a limited number of recipes in the supplied recipe/instruction booklet, do not despair as there an app available which has over 200 plus recipes from around the world. We will cover many more recipes using the Philips airfryer on this website as well as the myFoodJourneys channel on youtube. The appliance has a digital display with a touch interface. You can set the timer to a maximum of 60 minutes and the temperature to a maximum of 200 degrees Celsius or 395 degrees Fahrenheit. The appliance will stop cooking after the timer has reached the set time with an audible tone. The back of the unit has vents for the air flow. The power cord is also at the back of the appliance. The appliance has a removable drawer with a removable inner food basket. The drawer has a non-stick coating and acts as the drip tray.The inner food basket has a wire mesh that allows the air to flow through to the bottom of the appliance. The food basket does not have a non-stick coating and hence food can get stuck to the basket. To clean the basket you have to soak the basket in a warm soapy solution to get rid of stuck food that are difficult to remove. Both the drawer and food basket are dish washer safe. You can use other accessories like a grill pan and a baking tray. The grill pan is used for grilling meat, fish and vegetables. We were able to fit in three ramekens of 2.5 inches in height and 4 inches in diameter in the food basket. During the cooking process, you can always pause the airfryer and open the tray to have a visual check on the cooking. You can then push back the basket and continue the cooking process. So, what was the first food we tried to cook using the airfryer? Naturally it was french fries. All in all it took us about 28 minutes to cook the french fries. The fries turned out very well. Not bad for a first try. There are many more factors to take into account to get that perfect french fries and we will have recipes that will cover that. 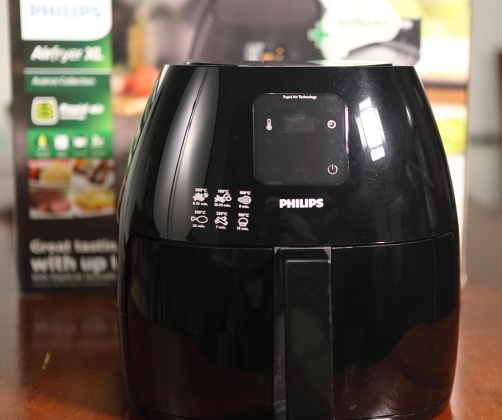 Below is the video review of the AirFryer.